Here's another one of my all time favorites. These candles are the bomb! I'm partial to Gold Canyon Candles because they smell incredible, offer a huge selection of scents, and I use to sell them. If you haven't heard about Gold Canyon Candles it would be worth your time to try one. They are sold on-line and through Fragrance Consultants throughout the United States. Do you burn candles in your home, if so what is your favorite scent? ***This blog post is my personal opinion and I did not receive compensation or free products from either company. 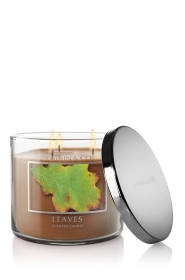 I love the way the Leaves candle smells too. I bought 5 of the mini ones because Bath and Body works had some kind of sale. I love the scent so much! I also love my Williams and Sonoma simmering spices that you add water to and warm on the stove. I have such a poor memory these days that I'm always worried I'm going to forget to blow out the candle or turn off the stove! Now I need to head to B&B Works today to smell the Leaves candle. :) I love candles but usually burn them for a few weeks and then forget about them. I've never heard of Gold Canyon Candles, might have to check that out! I hope you enjoy a great weekend, we are having family day tomorrow at the Pumpkin patch. I burn candles too but I have to watch because some will make me sick at my stomach...crazy I know. So far the Yankee Candles don't do it so I sort of stick with them! Hi Andrea! I love candles too, especially in the fall and winter. The Bath & Body candles are great! I've never tried the "Leaves" scent but that sounds like a good excuse to go shopping at B&B!! BB&B candle sounds wonderful - how can you go wrong with apples, cinnamon & cider - sounds like dessert! Thanks for stopping by my blog to see my fall porch. Your sweet comments made me smile! I am an avid candle burner as well- I'll have to give that one a try. I need to get over there for some lip gloss anyway :) Thanks for stopping by my blog!